For the month of December 2016 I compared once-per-day sea level air pressure values from my mercury barometer with Natrional Weather Service (NWS) simultaneous reported values at the local Chicago airports. There are two airports near me. O'Hare Airport is about 22.7 km WNW of me, while Midway Airport is about 18.6 km SW. Both distances are straight line. 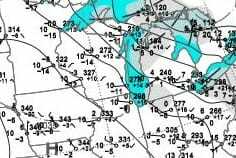 The O'Hare barometer altitude is 673 feet above sea level, while the Midway barometer altitude is 623 feet above sea level. My barometer is about 720 feet above sea level, largely because I'm on the 14th floor of a high rise building. Midway was the official Chicago weather station until January, 1980 when it was moved to O'Hare. The downward slope of the O'Hare linear trend line is -0.071 mb/month. The upward slope of the Midway linear trend line is 0.019 mb/month. Both are minor and probably represent random trends in mercury barometer reading errors. Five of the data points are outliers with larger differences. These occurred on December 8, 15, 18, 28, and 29. I looked at the NWS daily weather maps for these dates to see if the isobars were closely spaced. 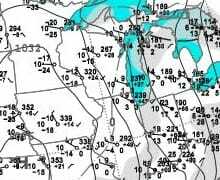 The following are the isobar maps. 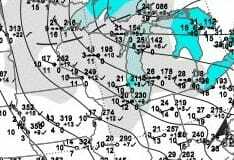 The isobars are at 4 mb intervals. The time of the weather maps is about 5 hours earlier than my mercury barometer readings. 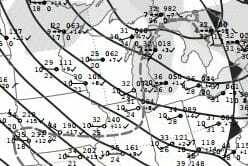 The isobars shown are reasonably closely spaced such that a larger pressure difference on these dates is at least plausible. The average upward slope to the linear trend line for the O'Hare data is only 0.0126 mb per mb barometric pressure. The average slope for the Midway comparison is 0.0158 mb per mb barometric pressure. Both are minor and probably represent random trends in mercury barometer reading errors. Based on this evaluation, I'm reasonably satisfied that my mercury barometer pressure values are valid.